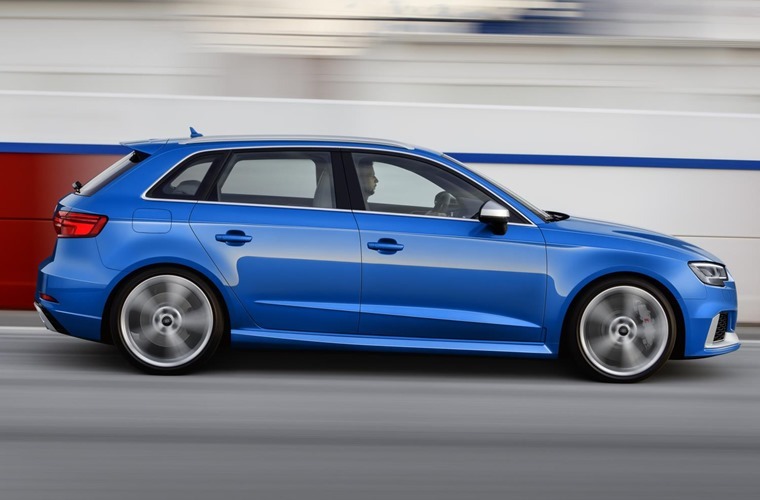 Audi has got it right with the RS 3 – a perfectly normal, everyday car that just happens to be faster than virtually anything else on the road. It's an everyday hero. Shoving 400 horsepower under the bonnet of a small hatchback sounds a little like overkill, but when there’s 275bhp in a Hyundai i30, 316bhp in a Honda Civic, and 345bhp in a Ford Focus, you’ve got to do something to stay ahead. It could all be overwhelming for what is, ultimately, a five-seater hatchback, but the way that glorious five-cylinder engine delivers its power is beautifully linear. There’s no sudden surge as the turbo kicks in, and no kick in the back as it finds the right gear and goes. Instead it just gathers speed at an alarming rate until you suddenly realise that the outside world has gone quite blurry. It’s then that you realise, despite the obvious signs from the trees and bridges around you, that the RS3 simply doesn’t stop accelerating. I had to give up when things got, err, near to the legal limit, but I’m reasonably certain it could carry on indefinitely. The gearbox, a seven-speed automatic, switches ratios quickly to ensure the engine is kept in its wide power band at all times, while also ensuring the noise from the exhausts is as antisocial as possible. I’m sure a quarter mile run would be a hoot, but there aren’t many drag strips open on a Wednesday in Cambridgeshire. 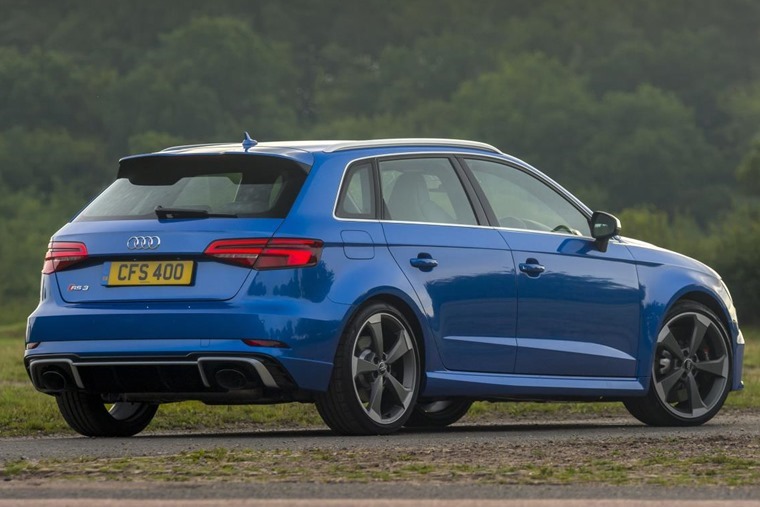 It’s not all about drag racing performance though, as Audi has thoroughly reworked the RS3 to make it more entertaining when there’s a kink in the road. Judicious use of aluminium, magnesium and other materials at the front of the car reduce overall weight, but especially over the front wheels, ensuring turn in is sharper and agility is improved. 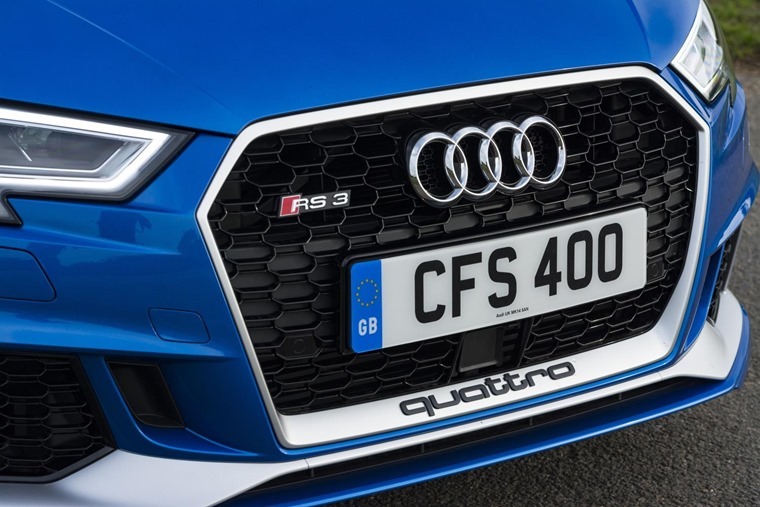 The Quattro four-wheel-drive system has been retuned to promote a degree of silliness rather than being purely about increased stability and traction. This means up to 50% of the power can now be transferred to the rear, allowing the brave to perform lurid power slides through clouds of tyre smoke. 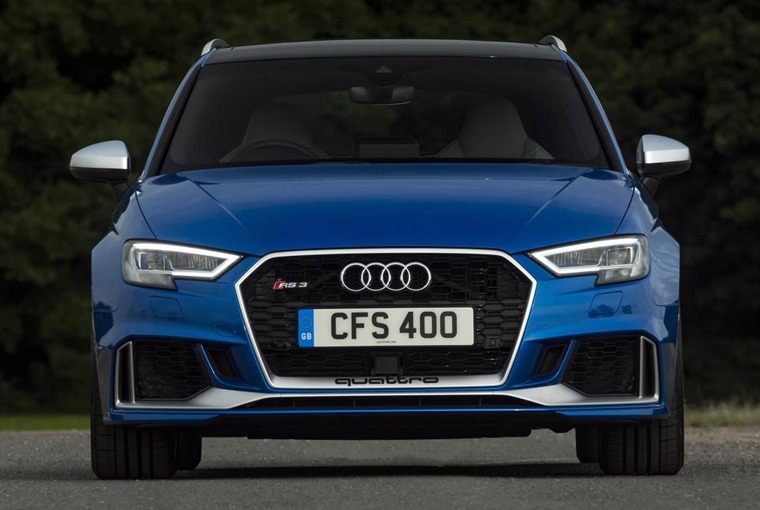 It’s near impossible to provoke the RS3 into doing anything beyond going very quickly in a safe and predictable fashion. Colleagues in Oman, where the car was launched, assure me that it’s possible to go everywhere sideways on their sand-covered dusty roads, but out here in Cambridgeshire there’s so much grip available that there was never even a hint of a squeak from the tyres. It is possible to turn off most of the fun-limiting computers, although they remain alert just in case things get seriously out of hand, but even then it’s near impossible to provoke the RS3 into doing anything beyond going very quickly in a safe and predictable fashion. Unless you’ve got an ASBO, you’ll never find the limit of the car’s abilities on UK roads. It takes the 400 horsepower and makes it feel eminently usable, almost to the point of disappointment. That sense of normality is exacerbated by the relentless normality of the rest of the car, although that’s really a good thing as an A3 without any degree of practicality makes no sense. There are five seats, although the middle one in the rear is unusable by anyone other than a wafer thin child. There’s room for a couple of child seats in the back too, with a boot behind that’s a handy size for a small family. 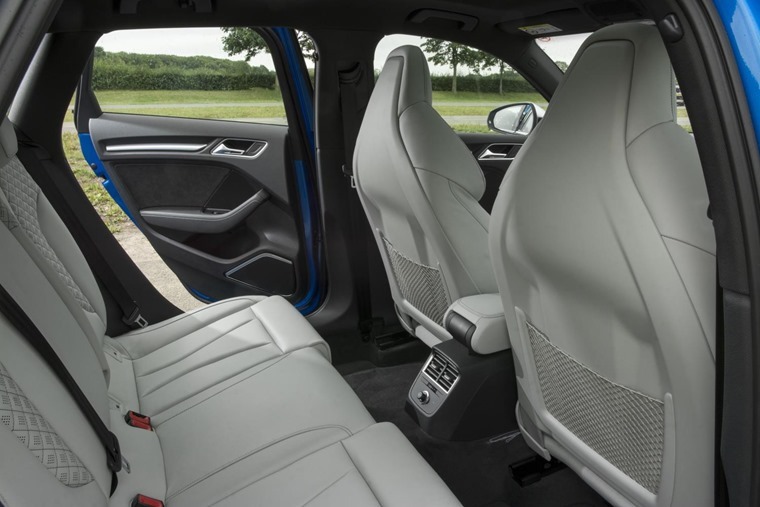 Fold down the rear seats and the RS3 becomes something of a mini van, such is the space available. Up front there’s a lovely dashboard that, despite not being of the latest Audi design language, merges classic round, chrome surrounded air vents with a modern infotainment system perched on top. The instrument binnacle has a 12.3in digital screen in place of regular dials, displaying satnav instructions, music details, or, if you’re feeling traditional, a speedometer and rev counter. There’s a DAB radio, Bluetooth and plenty of other toys to play with. It’s all put together as you would expect an Audi to be put together, so the fit and finish is unrivalled. Nappa leather seats, both supportive and stylish, are the only real clue that the RS3 is more special than a regular A3. Audi has produced a car with maniacal performance levels but ensured that it’s accessible and usable as a family car. Outside the clues are rather clearer, with lower suspension and bigger wheels under widely flared wheel arches gives the game away, while a unique grille and some massive chrome tailpipes add to the exclusive style. 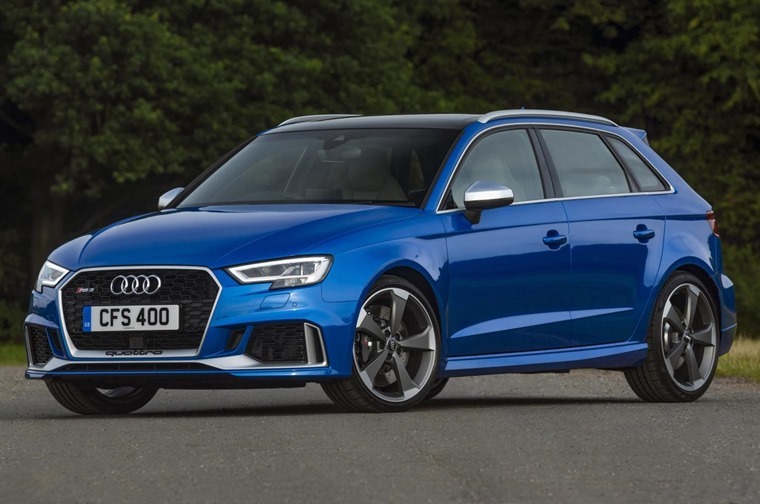 With the RS3 Audi has produced a car with maniacal performance levels but ensured that it’s accessible and usable as a family car, a combination that should keep everybody happy. Perhaps I’ve not grown up enough, but I miss the days when these cars looked fast, festooned with two-tone paint, spoilers and lurid badging, but the 40-year-old me appreciate the fact that I can get in and head to Waitrose without wondering whether I’ll spin off the road in a blur of flailing arms and endless understeer. And so I’m ultimately proof that Audi has got it right, producing a perfectly normal car that goes faster than virtually anything else on the road, an everyday hero. The asking price of £45,000 if a tad steep, but leasing rates start from around £500, which is only marginally more than you’d need to find for a Honda Civic Type R, making it surprisingly accessible. It’s difficult to find a reason not to go for it.